Syfy’s new flagship series Defiance wrapped up its first season this past Monday with an improvement on the ratings it had seen the previous few weeks. The season finale pulled a 0.7 rating in the all-important 18-49 demographic and 2.2 million total viewers. That’s up from the season low of a 0.5 rating it hit back in mid-June, but not nearly as good as the 1.0 score it pulled with its premiere in April. Syfy still has to consider this one a success and it is the highest rated scripted show the network has had in quite a while. But a continued ratings erosion may make the network reluctant to agree to a third season. And considering the fact that the sophomore year for the show will not bow until June of next year, that may be a big enough gap for fans that were already grumbling about the progress of the show (unfairly in my opinion) to lose interest by the time it returns. Still, the network will continue to tout this one as a win and may run a few marathons in the interim to keep interest in the show from waning too much. And there’s the online game as well that should continue to attract new viewers to the series. Also on Monday night, Warehouse 13 wrapped up its fifth season pulling a 0.5 rating in the 18-49 demo with 1.4 million total viewers which is right about where it was when it returned in April. Over on MTV, Teen Wolf improved its numbers to a 0.8 rating with 1.9 million total viewers. That show has been having its strongest season thus far ratings-wise. On Sunday, HBO’s True Blood won the night among cable shows again pulling a 2.3 rating with 4.1 million total viewers. That actually topped all of the offerings that the broadcast networks had on their schedules (which were mostly repeats) making it the most watched show for the evening in the 18-49 demo. And on TNT, Falling Skies improved to a 1.2 rating with 3.5 million total viewers. That show’s numbers are down a bit from last season, but it is still performing well for a basic cable series and TNT has already renewed it for a fourth season. I will probably return to just the one post next week if the ratings numbers finally catch up, but in the mean time keep an eye on the Cancellation Watch Twitter Site for the quickest ratings updates and any breaking news. Description: Nick, Hank, and Monroe quest to destroy the Coins of Zakynthos, but are caught in the middle of a centuries-long Wesen war. Surrounded by players with unclear agendas, the gang forges a reluctant alliance, as Kelly makes an escape from her captors! Description: GEORGE RR MARTIN returns to comics with Skin Trade, the World Fantasy Award winning story that combines Martin’s unique creative voice into a powerful vision of horror! Private investigator, Randi Wade sees the ravaged remains of innocent victims that have been savagely murdered and skinned. As the mysterious secrets of the Blackstone Manor begin to be uncovered, she gets ever closer to the monstrous truth. . . werewolves are real! George RR Martin combines his unmatched creative vision with the visceral illustrations of horror master Mike Wolfer to create something intensely unsettling. The first chapter of a new horror masterpiece is unveiled with Regular, Wraparound, Grisly and Skinned Retailer Incentive covers by series artist Mike Wolfer. Description: In search of their long-lost mother, Fire Lord Zuko and his deadly and insane sister Azula have brought Avatar Aang and his friends into a mysterious forest, but what they discover within may be more than they can face. Will they too be lost in these woods forever? * Perfect companion to Legend of Korra! * The official continuation of Airbender from its creators. From the producers of Battlestar Galactica, Caprica, and Farscape comes Defiance First Season DVD , the critically- acclaimed action-packed tale of courage, and survival. It’s 2046 and over 30 years have passed since aliens arrived, changing life on Earth forever. In the frontier town of Defiance, a drifter-turned-lawkeeper (Grant Bowler, True Blood) and the newly-appointed mayor (Julie Benz, Dexter) attempt to lead the human and alien residents through the prejudices and politics that threaten the fragile peace they’ve fought for. 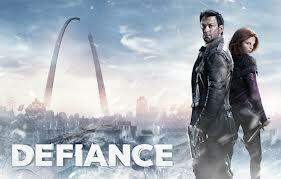 Combining epic scope with the intrigue of a small-town drama, Defiance First Season DVD is science fiction at its best. Watch every riveting episode back to back and uninterrupted, with exclusive bonus content including deleted scenes and featurettes that go inside this incredible new world.